The apartment, situated in an ancient “umbertino” building, faces a garden where “the Aquarium” (a particular building of the same period) rises. The recently renovated building, named 'the Architects' House”, now houses several exhibitions. The luxurious and comfortable b&b is the perfect accommodation for both tourists and business travellers thanks to its proximity to all the main attractions of the city. Our guests will lodge in a large early 1900's style apartment, with a long hall and spacious rooms. 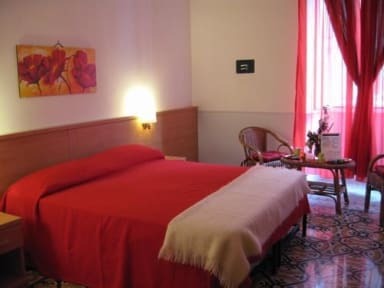 The Hold Rome B&B has been elegantly restructured, in order to meet the demands of our guests. The high ceilings and the original early 1900's Venetian mosaics floors perfectly fit in the modernity of the new restyle of the apartment. At your arrival you will be received by a serious and helpful staff, which will make its best to make your stay pleasant. Keys will be provided to every guest, so to be completely independent. 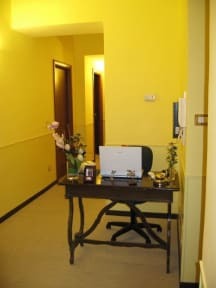 The rooms are equipped with air-conditioning, heating, mini-bar, wireless connection to internet, safe-deposit box, television and a private bathroom. All of the bathrooms are endowed with all the necessary accessories for your stay and cured in the design and in the quality of the materials. In the rooms is present fireproof alarm and in the bathrooms emergency call systems with the purpose to guarantee the safety of our guests.